Hepatitis C virus infection of hepatocytes is a multistep process involving the interaction between viral and host cell molecules. Recently, we identified ezrin–moesin–radixin proteins and spleen tyrosine kinase (SYK) as important host therapeutic targets for HCV treatment development. Previously, an ezrin hinge region peptide (Hep1) has been shown to exert anti-HCV properties in vivo, though its mechanism of action remains limited. In search of potential novel inhibitors of HCV infection and their functional mechanism we analyzed the anti-HCV properties of different human derived radixin peptides. Sixteen different radixin peptides were derived, synthesized and tested. Real-time quantitative PCR, cell toxicity assay, immuno-precipitation/western blot analysis and computational resource for drug discovery software were used for experimental analysis. We found that a human radixin hinge region peptide (Peptide1) can specifically block HCV J6/JFH-1 infection of Huh7.5 cells. Peptide 1 had no cell toxicity or intracellular uptake into Huh7.5 cells. Mechanistically, the anti-HCV activity of Peptide 1 extended to disruption of HCV engagement of CD81 thereby blocking downstream SYK activation, which we have recently demonstrated to be important for effective HCV infection of target hepatocytes. Our findings highlight a novel functional class of anti-HCV agents that can inhibit HCV infection, most likely by disrupting vital viral-host signaling interactions at the level of virus entry. The online version of this article (doi: 10.1007/s10989-013-9390-8) contains supplementary material, which is available to authorized users. 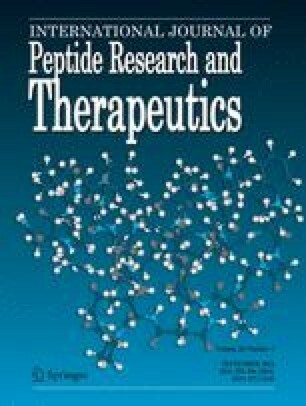 The authors are grateful to Dr. Charles M. Rice and Dr. Takaji Wakita for kindly providing reagents. This work was supported by Grant R37AA014372 (to G.S.). The authors declare there are no conflicts of interest and all ethical standards were upheld.